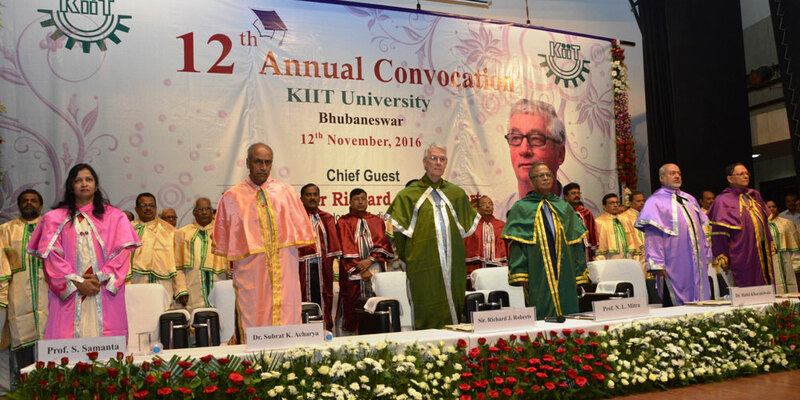 Total 4612 students of 2014 – 15 graduating batch of KIIT received their degrees at its 11th Annual Convocation in the presence of Professor Sir John E. Walker, Nobel Laureate in Chemistry (1997), U.K. and other dignitaries on November 7, 2015. The University conferred Honoris Causa Degree of D.Sc. on Prof. Walker and on four other eminent personalities – Prof. em. 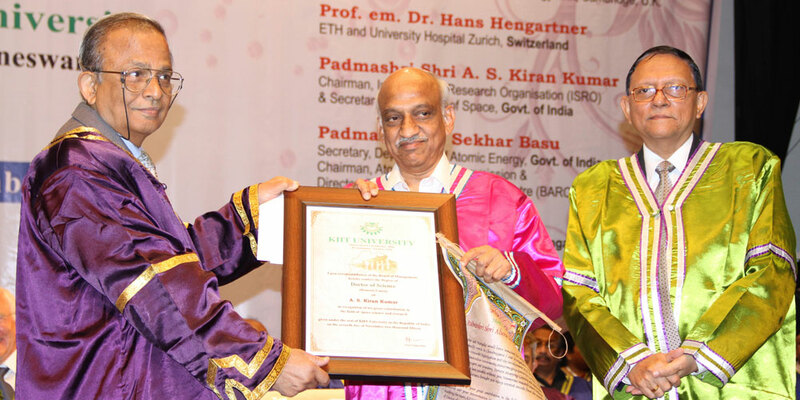 Dr. Hans Hengartner, ETH and University Hospital Zurich, Switzerland; Padmashri Shri A. S. Kiran Kumar, Chairman, Indian Space Research Organisation (ISRO) & Secretary, Department of Space, Govt. 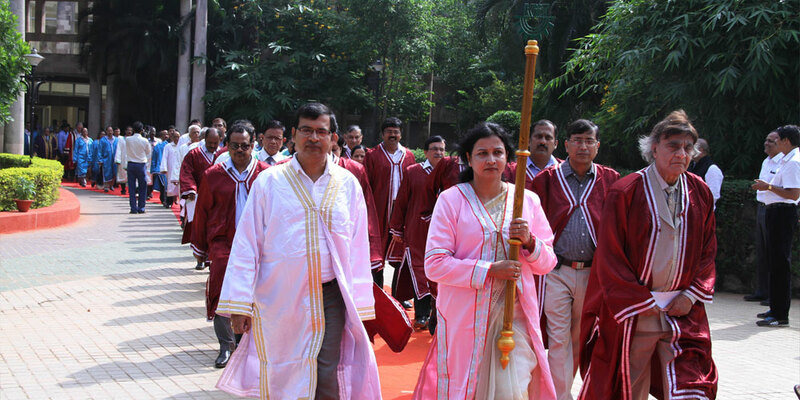 of India; Padmashri Dr. Sekhar Basu, Secretary, Department of Atomic Energy, Govt. 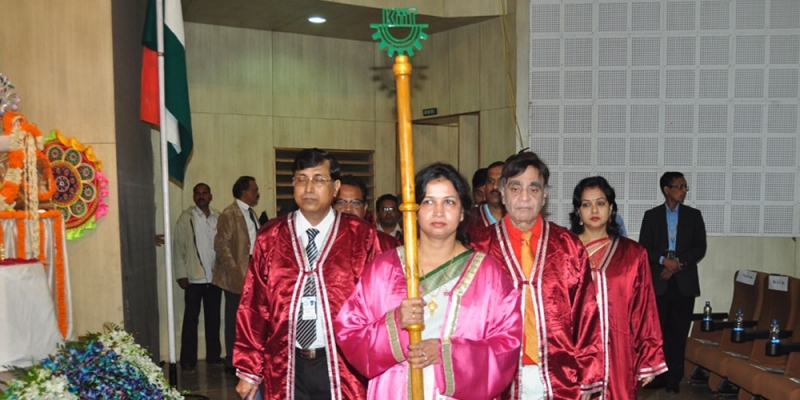 of India & Chairman, Atomic Energy Commission; and Dr. H. R. Nagendra, Chancellor, S-VYASA University, Bengaluru. Eminent economist Padmashri Dr. Bibek Debroy, Member, NITI Aayog, Govt. 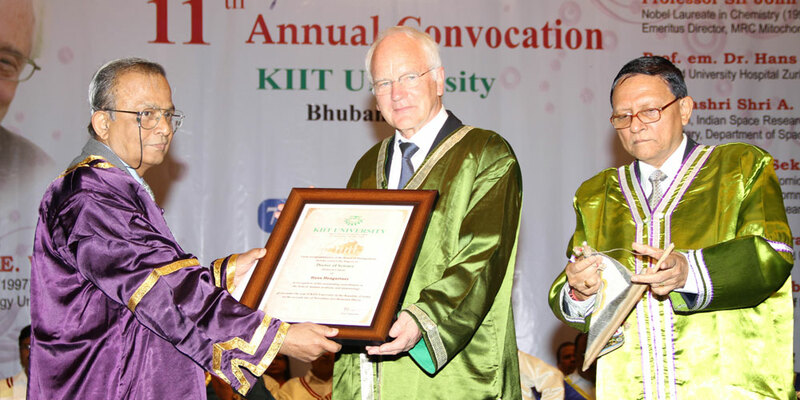 of India was honoured with Honoris Causa Degree of D.Litt. 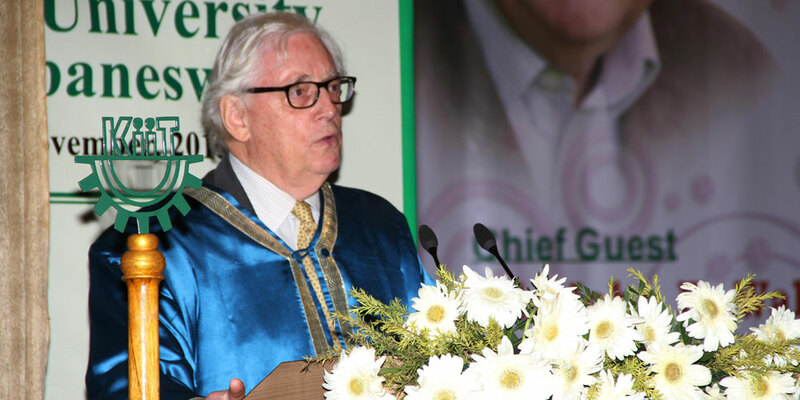 Delivering the convocation address, Prof. Walker said, reemergence of infectious diseases, declining quality of life in older population and global warming are the major challenges facing the mankind today. Rampant misuse of antibiotics has resulted in drug resistant strains of pathogens. Citing example of tuberculosis, which was brought under control earlier, he explained, the disease has made a comeback, killing about two million people every year. While life expectancy has risen, quality of life of older people has declined due to neurodegenerative disorders. There are at present very few opportunities to control and manage these diseases, Prof. Walker informed. Burning of fossil fuel for energy releases a vast amount of carbon dioxide in the atmosphere, causing the temperature to rise. Global warming will have serious consequences on the planet, he warned, while advising students to use their education to contribute in solving these burning issues. Expressing gratitude for the honorary D.Sc. 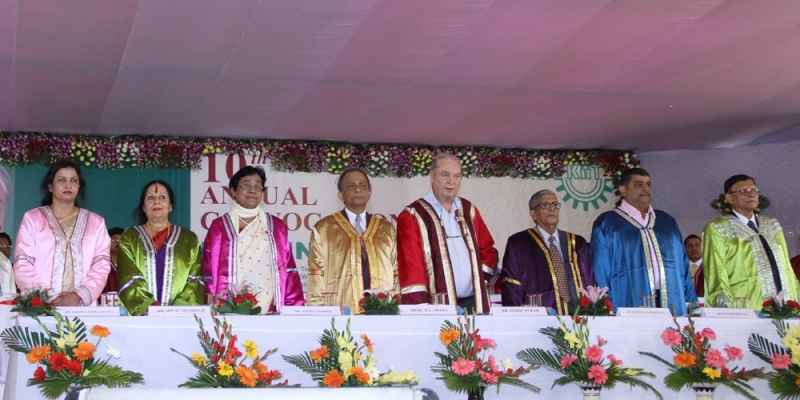 degree, the Nobel laureate said, “I am greatly impressed by the progress made by this young University in such a short time and for this I offer my respect and admiration to its founder Dr. Achyuta Samanta”. Prof. Walker, whose landmark crystallographic studies of the F1-ATPase won him Nobel Prize in Chemistry in 1997, is presently Emeritus Director of MRC Mitochondrial Biology Unit, Cambridge. Accepting the honorary D.Sc. degree, Prof. em. 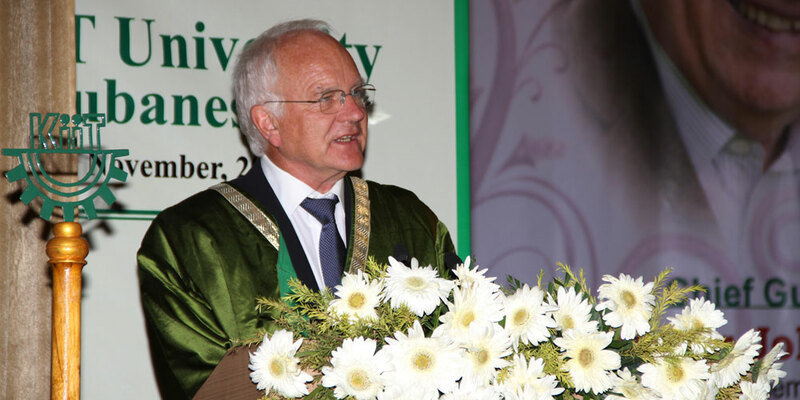 Dr. Hans Hengartner stated, “I am involved with KIIT University and Kalinga Institute of Social Sciences (KISS) for last seven years and I am impressed to see how the two institutions have developed fantastically over the years.” He advised students to set realistic goals and work hard to achieve them. 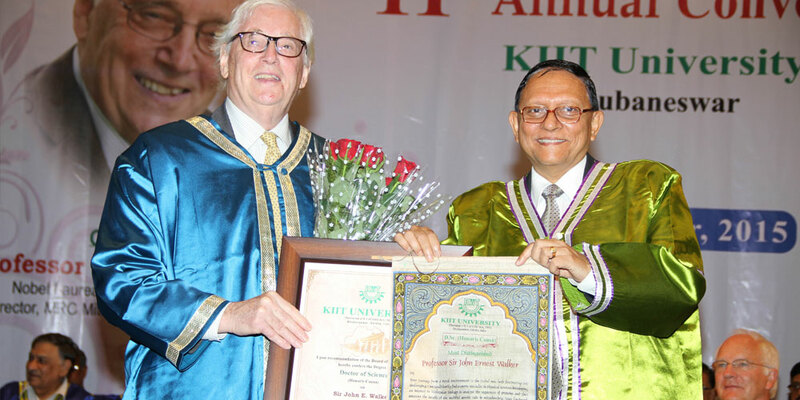 The honour was conferred to him in recognition of his outstanding contribution in the field of human medicine and immunology. It is not an individual recognition, but recognition to ISRO, which is striving to apply space technology for the benefit of people for more than last five decades, said Padmashri Shri A. S. Kiran Kumar in his acceptance remarks. 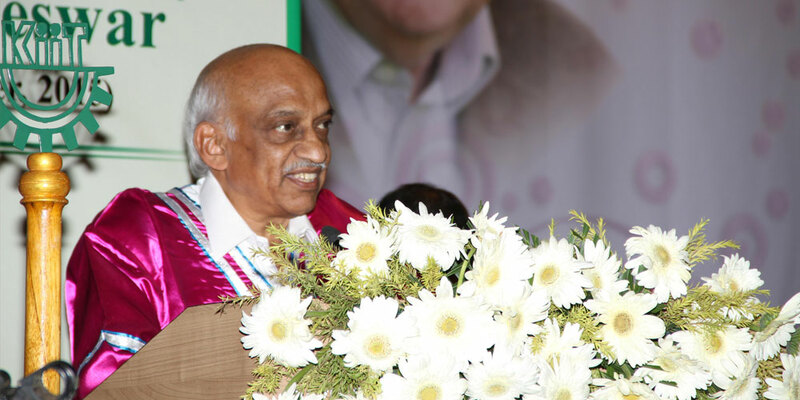 Shri Kiran Kumar is a highly accomplished space scientist with a career spanning over four decades in ISRO. 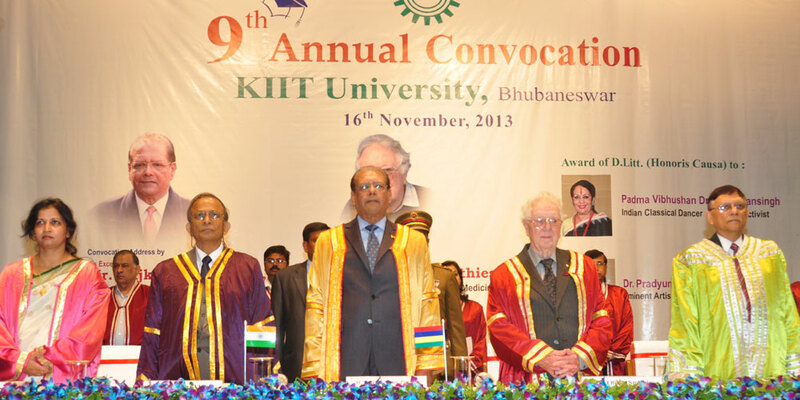 He was conferred the honour in recognition of his great contribution in the field of space science and research. 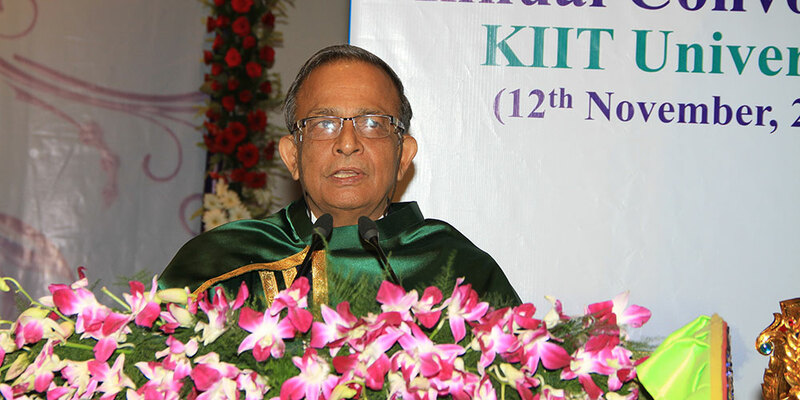 Expressing gratitude to KIIT for the honour, Padmashri Dr. Sekhar Basu said, enthusiasm of faculty and students of KIIT in the area of research is impressive. 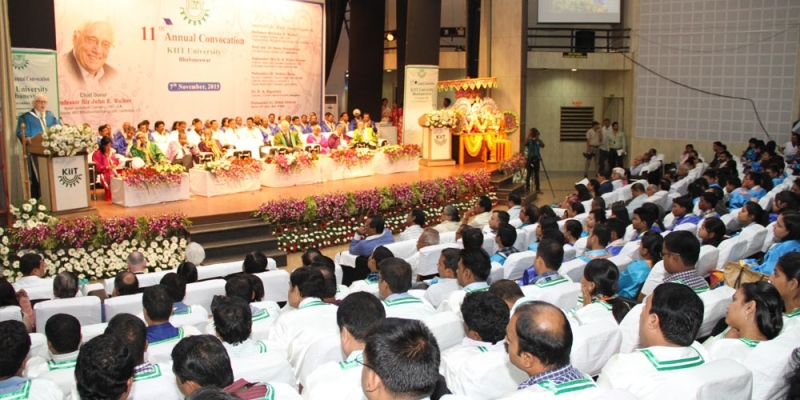 Work done by Dr. Samanta to establish this institution will take the country forward, he added. Dr. Basu was given the honour in recognition of his outstanding research and stupendous contribution to India’s Nuclear Programme. 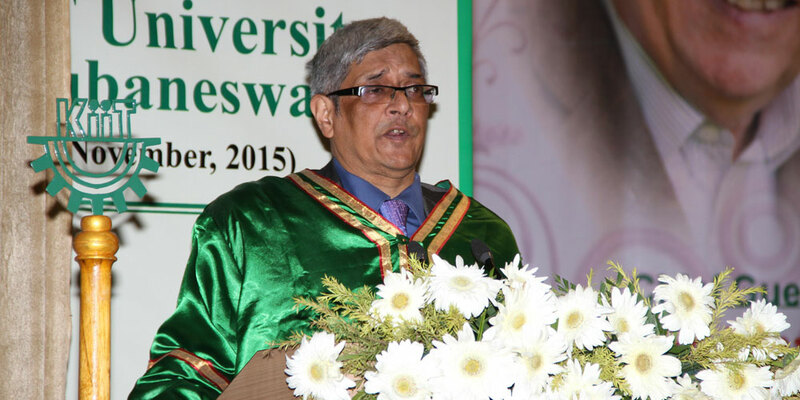 In his acceptance speech, Dr. H. R. Nagendra said, “It is an achievement for my entire team. 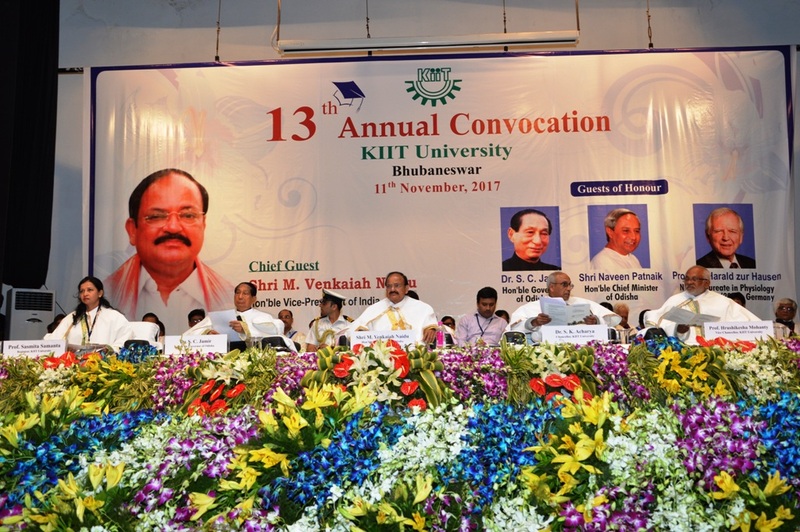 S-VYASA University is working to translate Swami Vivekananda’s vision into reality.” He congratulated Dr. Samanta for establishing KIIT , which is a great contribution to this part of the world. 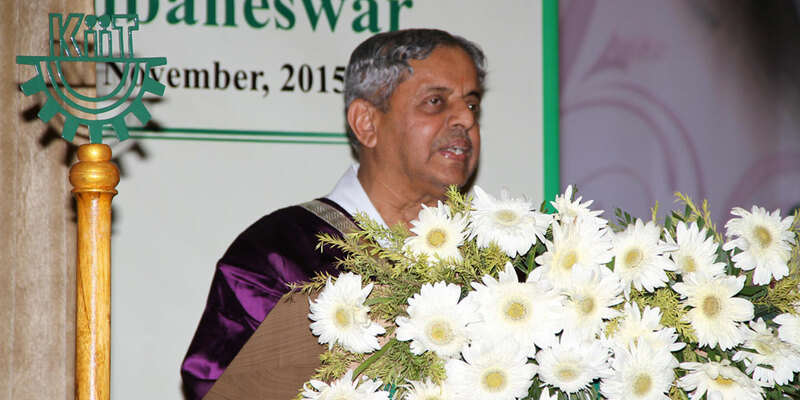 Dr. Nagendra was conferred D.Sc. honoris causa in recognition of his service to mankind as an illustrious yoga teacher and a distinguished Ayurvedic therapist. 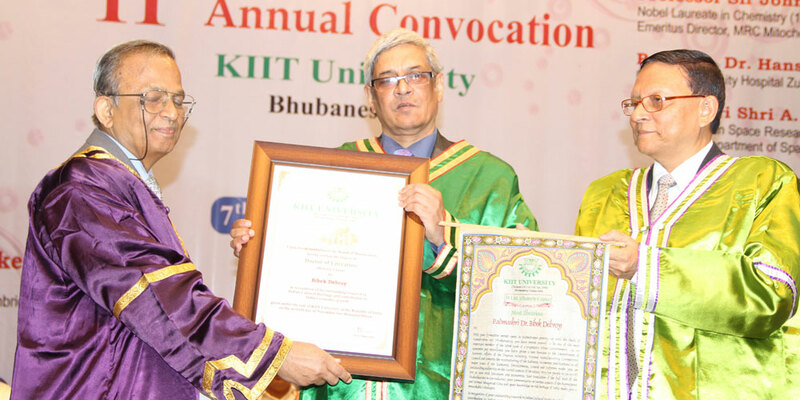 Similarly, Padmashri Dr. Bibek Debroy was conferred D.Litt. 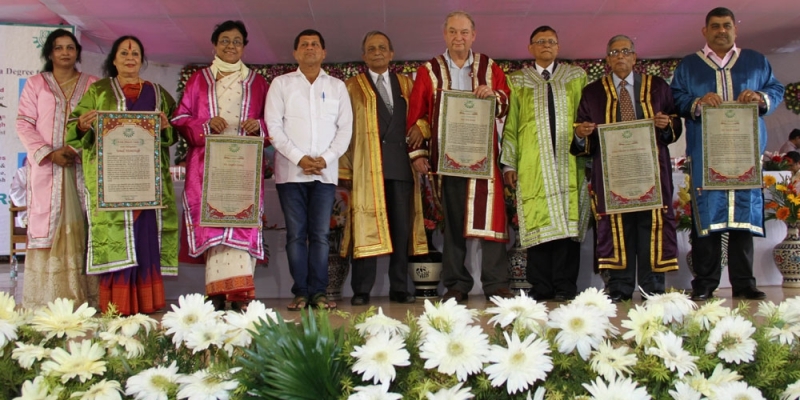 honoris causa in recognition of his outstanding research in Indian Cultural Heritage and contribution to India’s economic growth. “I receive it on behalf of all those who have contributed in my journey”, he said in his acceptance speech. 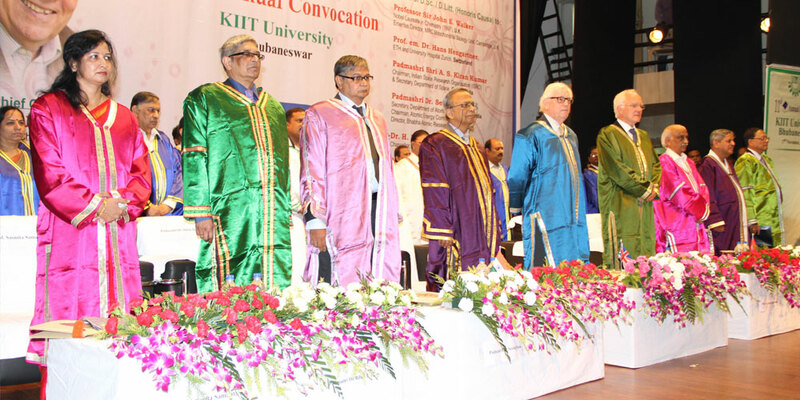 Expressing best wishes to the graduate students, Prof. N. L. Mitra, Chancellor, KIIT , in his presidential address, said that this is the third consecutive convocation in KIIT addressed by Nobel laureates, creating a noble hat-trick in motivating researchers. 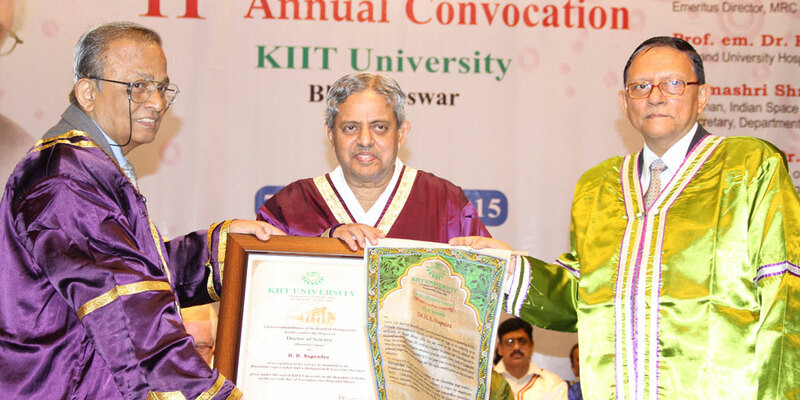 Entire nation is now expecting high achievement and excellence from KIIT in years to come, he added. Earlier in his report, Vice Chancellor, Prof. P. P. Mathur informed that the University is home to around 25,000 students from different states of the country and abroad. Faculty members of the University have actively involved themselves in research and consultancy projects from various industries, he said, adding that currently 103 research and consultancy projects funded by various national and international funding agencies are ongoing. 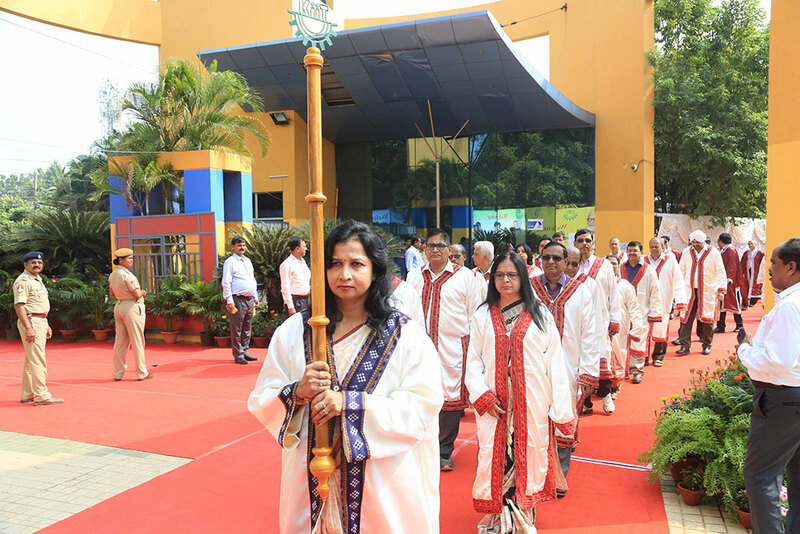 Manisha Priyadarshini (B.Tech. C.Sc. 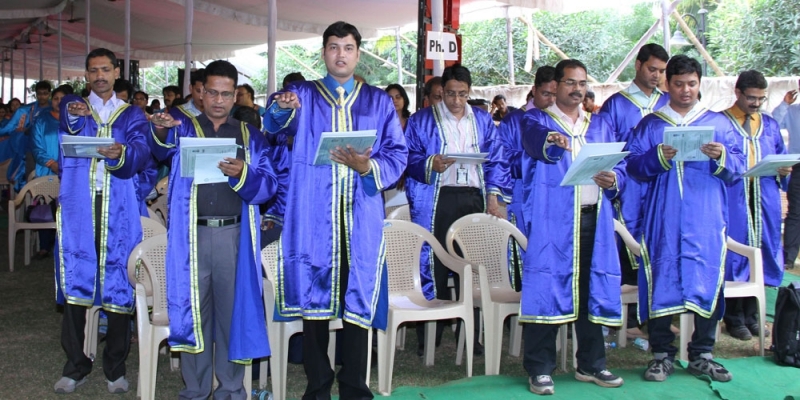 & MBA – Dual Degree), Payel Giri, M.Tech. (C.E.) 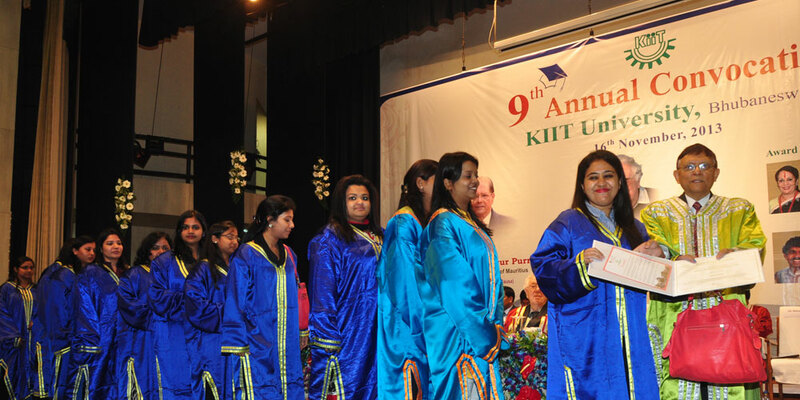 and Preeti Kumari (B.Tech) won Founder’s Gold Medals for their outstanding all round and academic performance. 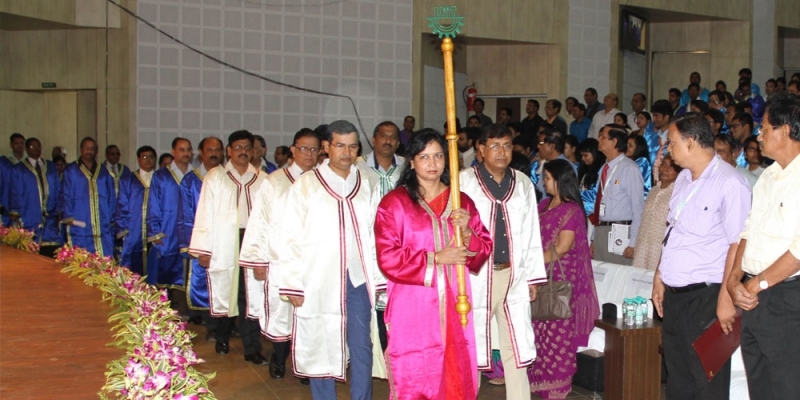 Similarly, 15 students were awarded Chancellor’s Gold Medal, while 25 students got Vice Chancellor’s Silver Medal. P.K. Bal Memorial Gold Medal, PPL Gold Medal and Nanibala Memorial Gold Medal were also given away on the occasion. Thirty nine research scholars were awarded Ph.D. degrees.